Kuala Lumpur is the cultural, financial, and economic centre of Malaysia. 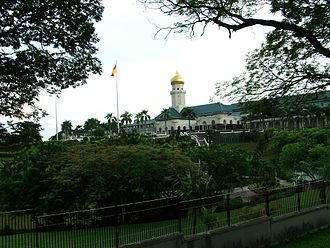 It is also home to the Parliament of Malaysia, and the official residence of the Malaysian King (Yang di-Pertuan Agong), the Istana Negara. 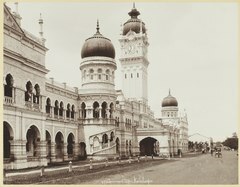 The city once held the headquarters of the executive and judicial branches of the federal government, but these were relocated to Putrajaya in early 1999. However, some sections of the political bodies still remain in Kuala Lumpur. Kuala Lumpur is one of the three Federal Territories of Malaysia, enclaved within the state of Selangor, on the central west coast of Peninsular Malaysia. Since the 1990s, the city has played host to many international sporting, political, and cultural events including the 1998 Commonwealth Games and the 2017 Southeast Asian Games. Kuala Lumpur has undergone rapid development in recent decades, and is home to the tallest twin buildings in the world, the Petronas Towers, which have since become an iconic symbol of Malaysian development. Kuala Lumpur has a comprehensive road system supported by an extensive range of public transport networks, such as the Mass Rapid Transit (MRT), Light Metro (LRT), Bus Rapid Transit (BRT), monorail, commuter rail, and an airport rail link. Kuala Lumpur is one of the leading cities in the world for tourism and shopping, being the tenth most-visited city in the world in 2017. The city houses three of the world's ten largest shopping malls. From the 1990s onwards, under the initiative the Prime Minister Mahathir Mohamad, major urban developments in the Klang Valley has resulted in an extended Kuala Lumpur Metropolitan Area. This area, known as Greater Kuala Lumpur, extends from the Federal Territory of Kuala Lumpur westward to Port Klang, east to the edge of the Titiwangsa Mountains as well as to the north and south. The area covers other administratively separate towns and cities such as Klang, Shah Alam, Putrajaya and others, and it is served by the Klang Valley Integrated Transit System. Notable projects undertaken within Kuala Lumpur itself include the development of a new Kuala Lumpur City Centre around Jalan Ampang and the Petronas Towers. Bahasa Malaysia is the principal language in Kuala Lumpur. Kuala Lumpur residents are generally literate in English, with a large proportion adopting it as their first language. Malaysian English is a variant widely used. It has a strong presence, especially in business and is a compulsory language taught in schools. Cantonese and Mandarin are prominent as they are spoken by the local majority Chinese population. Another major dialect spoken is Hakka. While Tamil is dominant amongst the local Indian population, other Indian languages spoken by minorities include Telugu, Malayalam, Punjabi and Hindi. Beside the Malay language, there are a variety of languages spoken by people of Indonesian descent, such as Minangkabau and Javanese. KTM Komuter is a commuter rail service brand in Malaysia operated by Keretapi Tanah Melayu. It was introduced in 1995 to provide rail services in Kuala Lumpur. The service was introduced in Greater Penang on September 2015 after the completion of the Ipoh-Padang Besar Electrification. The trains used are air-conditioned electric multiple units, park & Ride facilities are provided at stations at a nominal charge. KTM Komuter contributed RM151.5 million to group revenue in 2016, KTM Komuters 175 km metre-gauge network in the Central Sector mainly cover in Klang Valley has 53 stations. It consists of two cross-city routes, namely the Port Klang Line and Seremban Line, transfers between the two main lines can be made at any of the four stations on the central core, KL Sentral, Kuala Lumpur, Bank Negara and Putra. Same-platform or cross-platform interchange is available at Kuala Lumpur, KTM Komuter services shopping complexes and recreational centres. The Mid Valley station opened in 2004 next to the Mid Valley Megamall, other shopping centres near KTM Komuter stations are Subang Parade, ÆON BiG Subang Jaya and The MINES. Passengers for Kuala Lumpur International Airport may take the KTM Komuter to Nilai Komuter halt and change to an airport bus, interchange with the Rapid network is available at Bandar Tasik Selatan station for the Sri Petaling Line and at KL Sentral for the Kelana Jaya Line. Passengers may transfer to the Ampang Line in the city centre at Bank Negara station by means of a 200-metre covered walk to the Bandaraya LRT station, KTM Komuter tickets are sold at counters and via vending machines, available at all stations and halts. The service is subject to overcrowding during rush hours, to help alleviate this, the operator introduced a new queuing system to help passengers line up when the trains are coming. The lines are painted on the floor with three colour codes representing each of the train set, the system was first implemented at KL Sentral station on 17 October 2008. The operator is considering introducing express services between Sungai Buloh and Kajang stations and between Kuala Lumpur and Shah Alam station during rush hours by the end of 2008. The Kuala Lumpur Tower is a tall tower located in Kuala Lumpur, Malaysia. Its construction was completed on 1 March 1995 and it is used for communication purposes and features an antenna that reaches 421 metres and is the 7th tallest freestanding tower in the world. The roof of the pod is at 335 metres, the rest of the tower below has a stairwell and an elevator to reach the upper area, which contains a revolving restaurant, providing diners with a panoramic view of the city. Races are held annually, where participants race up the stairs to the top, the tower is the highest viewpoint in Kuala Lumpur that is open to the public. The official groundbreaking for the Kuala Lumpur Tower was overseen by the 4th Prime Minister of Malaysia, construction of the tower was a three-phase process. The first phase was the widening of Jalan Bukit Nanas and the excavation of soil from the construction site and this phase was completed on 1 August 1992. 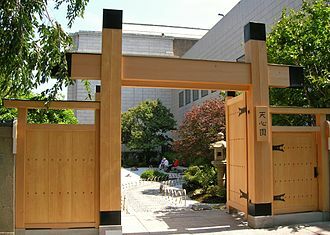 On 1 July 1992, the second began with the construction of the foundation. Approximately 50,000 cubic metres of concrete were poured for 31 hours. The foundation work, requiring no piling, was completed on 1 April 1993, the third phase was the construction of the superstructure which began in Mays 1994. The construction of the tower started with the erection of the tower shaft, as the finishing touches to the tower head were applied, the construction of the touristic building began. The main lobby of the ground floor is decorated with exquisite glass-clad domes that sparkle like giant diamonds. These domes were designed and arranged in the form of the Muqarnas by Iranian craftsmen from Isfahan. On 13 September 1994, Prime Minister Mahathir Mohammad performed the ceremony where the antenna mast was installed. After installation of facilities and amenities, Menander Kuala Lumpur was opened to public on 23 July 1996, Menara Kuala Lumpur was officially inaugurated by Prime Minister Mahathir Mohamad on 1 October 1996 at 20,30 MST. Kuala Lumpur Tower, a member of the World Federation of Great Towers, is utilised by several organisations for various broadcasting purposes, originally intended only for television broadcasting, radio antennas were included during the construction. Peninsular Malaysia, known as West Malaysia, is the part of Malaysia which lies on the Malay Peninsula and surrounding islands. Its area is 130,598 square kilometres and it shares a land border with Thailand in the north. To the south is the island of Singapore, across the Strait of Malacca to the west lies the island of Sumatra. East Malaysia is to the east across the South China Sea, Peninsular Malaysia accounts for the majority of Malaysias population and economy, as of 2015 its population is roughly 25 million. In 1963, the name Malaysia was adopted by the new federation uniting the Federation of Malaya, North Borneo, Sarawak, at the time, the Philippines had contemplated adopting the name. 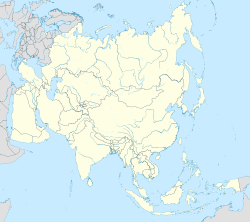 Peninsular Malaysia is known as West Malaysia or Malaya, in current everyday usage the word Malaya is almost always used jocularly, e. g. Gempar satu Malaya. 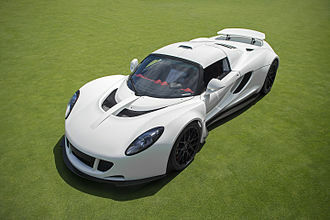 Which roughly means shakes the whole of Malaya, the term Malaya generally included Singapore until 1946, when Singapore was excluded from the formation of Malayan Union. The National Mosque of Malaysia is a mosque in Kuala Lumpur, Malaysia. It has a capacity for 15,000 people and is situated among 13 acres of beautiful gardens, the original structure was designed by a three-person team from the Public Works Department, UK architect Howard Ashley, and Malaysians Hisham Albakri and Baharuddin Kassim. The mosque was built in 1965 on the site of a church, the Venning Road Brethren Gospel Hall, the mosque is a bold and modern approach in reinforced concrete, symbolic of the aspirations of a newly independent Malaysia. Its key features are a 73-metre-high minaret and a 16-pointed star concrete main roof, the umbrella, synonymous with the tropics, is featured conspicuously – the main roof is reminiscent of an open umbrella, the minarets cap a folded one. The folded plates of the main roof are a creative solution to achieving the larger spans required in the main gathering hall. Reflecting pools and fountains throughout the compound. 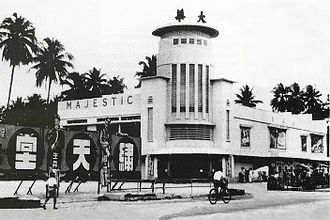 Malaya gained its independence from the British government on 31 August 1957, major development programs in areas of economy and architecture were actively implemented in line with the new government. The programs were to portray new progressive culture and achieved democracy, therefore, on 30 July 1957, in the meeting of the Federal Executive Council an idea to build a national mosque as a symbol of the country’s independence was mooted. 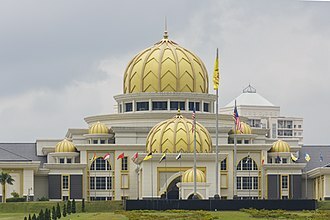 However, Tunku refused this honour, on the contrary he named it Masjid Negara in thanksgiving for the peaceful independence without bloodshed. On Friday,27 August 1965, the mosque was declared open by the third Yang di-Pertuan Agong, the mosque underwent major renovations in 1987, and the once-pink concrete roof is now clad in green and blue tiles. Today, Masjid Negara continues to stand sleek and stylish against the Kuala Lumpur skyline, an underground passage leads to the National Mosque located near the railway station, along Jalan Sultan Hishamuddin. Its unique modern design embodies a contemporary expression of traditional Islamic art calligraphy, near the mosque is the Makam Pahlawan, a burial ground of several Malaysian Muslim leaders. Makam Pahlawan is a 7-pointed star concrete roofed structure, on 27 August 2015, Masjid Negara celebrated its Golden Jubilee. Kuala Lumpur, officially the Federal Territory of Kuala Lumpur, or more commonly called KL is the national capital of Malaysia as well as its largest city. Being rated as an Alpha world city, Kuala Lumpur is the global city in Malaysia which covers an area of 243 km2 and has an estimated population of 1.73 million as of 2016. Greater Kuala Lumpur, known as the Klang Valley, is an agglomeration of 7.25 million people as of 2017. It is among the fastest growing regions in South-East Asia, in terms of population. Kuala Lumpur is the seat of the Parliament of Malaysia, the city was once home to the executive and judicial branches of the federal government, but they were moved to Putrajaya in early 1999. Some sections of the judiciary still remain in the city of Kuala Lumpur. The official residence of the Malaysian King, the Istana Negara, is situated in Kuala Lumpur. Kuala Lumpur is the cultural and economic centre of Malaysia due to its position as the capital as well as being a key city. Kuala Lumpur is one of three Federal Territories of Malaysia, enclaved within the state of Selangor, on the central west coast of Peninsular Malaysia. Since the 1990s, the city has played host to international sporting and cultural events including the 1998 Commonwealth Games. Kuala Lumpur has undergone rapid development in recent decades and it is home to the tallest twin buildings in the world, the Petronas Twin Towers, which have become an iconic symbol of Malaysias futuristic development. Kuala Lumpur means muddy confluence, kuala is the point where two rivers join together or an estuary, and lumpur means mud. One suggestion is that it was named after Sungai Lumpur, it was recorded in 1824 that Sungei Lumpoor was the most important tin-producing settlement up the Klang River. It has proposed that Kuala Lumpur was originally named Pengkalan Lumpur in the same way that Klang was once called Pengkalan Batu. Another suggestion is that it was initially a Cantonese word lam-pa meaning flooded jungle or decayed jungle, there is however no firm contemporary evidence for these suggestions other than anecdotes. It is possible that the name is a form of an earlier. The 1998 games were the first held in an Asian country and the last Commonwealth Games of the 20th century. 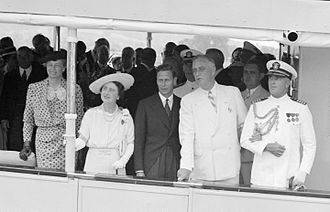 This was the first time the games place in a nation with a head of state other than the Head of the Commonwealth. 3638 athletes from 69 Commonwealth member nations participated at the games with 34 of them collected medals, for the first time ever, the games included team sports. The other bid from the 1998 games came from Adelaide in Australia, Malaysia is the eighth nation to host the Commonwealth Games after Canada, Australia, New Zealand, Wales and Scotland. The final medal tally was led by Australia, followed by Canada, several games records were broken during the games. With little or no controversy at all, the games were deemed generally successful,69 teams were represented at the 1998 Games. The 16th Commonwealth Games opening ceremony took place on 11 September 1998 at 17,30 MST. 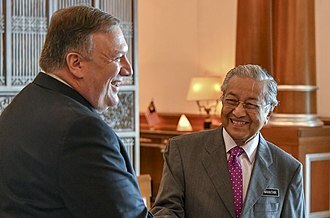 Contrary to tradition, the games were not officially opened by the Malaysian head of state, the Prime Minister of Malaysia, Tun Dr.
Mahathir bin Mohamad, opened the games. The venue for the opening and closing ceremonies was the newly built National Stadium Bukit Jalil, the games featured 15 sports with 3638 athletes as 69 teams were represented. The theme of the ceremony was Unity towards Progress, which was conveyed through dance, music. Malaysian schoolgirls unfurled hundreds of umbrellas, and brightly attired performers danced. Approximately 5,000 volunteers displayed coloured cards which depicted sporting images and they created pictures of flags of the Commonwealth nations, scenes of Malaysian lifestyle, and depictions of Malaysian achievements just by changing the colour of their hand-held cards. The Singaporean delegation was jeered by the crowd during the parade of nations, the end of the ceremony featured fireworks of various colours and shapes—forming hoops and fountains. The opening ceremonys broadcast concluded at 00,00 MST, than the originally planned at 23,00 MST. The Commonwealth Gamess official theme, Bersama-sama Gemilangkannya, was composed by the Malaysian Philharmonic Orchestra, raihan was official theme song of the 1998 Commonwealth Games. Petaling Street is a Chinatown located in Kuala Lumpur, Malaysia. Haggling is a common sight here and the place is crowded with locals as well as tourists. The area has dozens of restaurants and food stalls, serving local favourites such as Hokkien mee, ikan bakar, asam laksa, traders here are mainly Chinese but there are Indian and Bangladeshi traders. The original Chinatown centred on Market Square, the High Street was popular as it was higher than the rest of the town and was therefore less prone to floods, and the wealthier population were inclined to build their shophouses here. 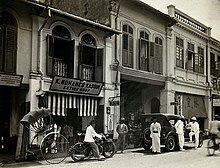 As a result, the more ornate shop houses were built north of Jalan Cheng Lock, Kuala Lumpur was a typical pioneer town around the start of the 20th century. 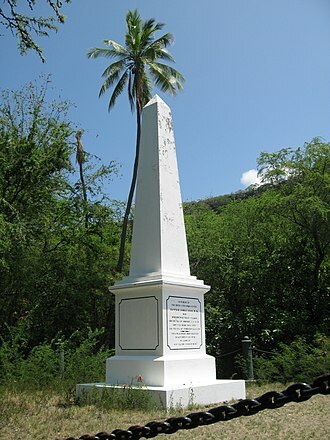 The population was male and they were typical of the rough and tough pioneers of those times. The men were mainly Cantonese and Hakkas who had come to the city because of the tin trade and they were governed by a Chinese Kapitan or headman. The most famous Chinese Kapitan was Yap Ah Loy, a Hakka, in 1870, civil war erupted within the Chinese community. This was split along partisan lines between the Hokkien Ghee Hin and the Hakka Hai San secret societies, the British realizing that the war is disrupting their economy and chain of supply, decided to enter the war. 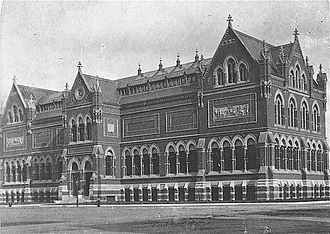 As a result of the civil war, many buildings were destroyed or severely damaged. During this Selangor Civil War, the tin mines were abandoned, the neglect during this time caused them to become flooded. When the war was over, and when the miners returned after the war, Yap Ah Loy managed to persuade the miners and coolies to remain in KL and persuaded the Malays in surrounding districts to grow rice and other garden products. He opened a Tapioca Mill in Petaling Street where the tubers from his farms were brought to be ground into flour, Petaling Street is fondly called ‘Chee Cheong Kai’ in Cantonese which means Starch Factory Street. There is a McDonalds on the 1st shop lot of Petaling Street, nearby is a Chinese bookshop. And there are the stalls selling a variety of local food like Hainanese chicken rice. Jawi is an Arabic alphabet for writing the Malay language, Banjarese, Tausūg and several other languages in Southeast Asia. Jawi is one of the two scripts in Brunei, used as an alternative script in Malaysia and Malay dominated areas in Indonesia. It can be typed with the Jawi keyboard, day-to-day usage of Jawi is maintained in more conservative Malay-populated areas such as Kelantan in Malaysia and Pattani. 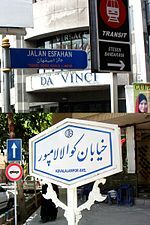 Jawi is still used on road and building signs, and taught in primary and religious schools in Brunei. The word Jawi is an adjective for the Arabic noun Jawah, both terms may have originated from the term Javadwipa, the ancient name for Java. Prior to the onset of the Islamisation, when Hindu-Buddhist influences were still firmly established in the region and this is evidenced from the discovery of several stone inscriptions in Old Malay, notably the Kedukan Bukit Inscription and Talang Tuwo inscription. 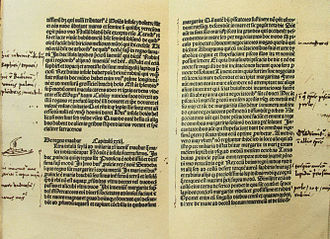 The spread of Islam in Southeast Asia and the subsequent introduction of Arabic writing system began with the arrival of Muslim merchants in the region since the seventh century. The conversion of King Phra Ong Mahawangsa of Kedah in 1136, at the early stage of Islamisation, the Arabic script was taught to the people who had newly embraced Islam in the form of religious practices, such as the recitation of Quran as well as salat. Many Arabic characters are never used as they are not pronounced in Malay language and this was the same for the acceptance of Arabic writing in Turkey and India which had taken place earlier and thus, the Jawi script was deemed as the writing of the Muslims. The inscription on the stone contains a proclamation issued by the Sri Paduka Tuan of Terengganu, urging his subjects to extend and uphold Islam and this has attested the strong observance of the Muslim faith in the early 14th century Terengganu specifically and the Malay world as a whole. The development of Jawi script was different from that of Pallava writing which was restricted to the nobility. The Jawi script was embraced by the entire Muslim community regardless of class, with the increased intensity in the appreciation of Islam, scriptures originally written in Arabic were translated in Malay and written in the Jawi script. Additionally local religious scholars began to elucidate the Islamic teachings in the forms of original writings, there were individuals of the community who used Jawi for the writing of literature which previously existed and spread orally. With this inclusion of literature, Malay literature took on a more sophisticated form. This was believed to have taken place from the 15th century, other forms of Arabic-based scripts existed in the region, notably the Pegon alphabet of Javanese language in Java and the Serang alphabet of Bugis language in South Sulawesi. Both writing systems applied extensively the Arabic diacritics and added several alphabets other than Jawi alphabets to suit the languages, due to their fairly limited usage, the spelling system of both scripts did not undergo similar advance developments and modifications as experienced by Jawi script. The script became prominent with the spread of Islam, as the Malays found that the earlier Pallava script was totally unsuited as a vehicle to relay religious concepts. The BRT Sunway Line is a bus rapid transit line that is part of the Klang Valley Integrated Transit System servicing the southeastern suburbs of Petaling Jaya, Malaysia. The BRT buses have an exclusive right-of-way on a guideway that is not shared with normal road traffic. This specially-dedicated and grade separated guideway for BRT Sunway Line buses is almost similar to rapid transit elevated railways, bus operators other than Rapid Bus, do not have the rights to use it and there is no ramp available from at-grade roads to the elevated guideway. This closed system is dedicated for a volume of commuters to avoid congestion. However, this system can only be used along the 5.4 km track between Setia Jaya and USJ7 terminals that allow for interchange to rail transit. The BRT system has received Bronze rating by BRT Standard score from Institute for Transportation, in February 2014, BYD won the bid to supply 15 new battery-run electric bus for Prasarana Malaysia. The buses use an iron phosphate battery which is fire-safe and non-toxic, in-wheel hub motors. There are no caustic materials contained in the battery and no toxic electrolytes or heavy metals, the source said that the buses are very quiet and ensures a comfortable ride without vibrations, jerks or noise associated with the conventional buses and combustion engines. The bus can drive for more than 250 kilometres even in heavy city traffic on a single charge. Bus rapid transit is a system that utilises dedicated bus lanes, universal access stations, integrated pedestrian access, rapid boarding. It is a new concept in Malaysia although it has been implemented successfully in cities such as Bogotá, Jakarta, Indonesia. BRT Sunway is a partnership project between Prasarana and Sunway Group to provide a better and integrated transit service for the residents and commuters of Bandar Sunway. The line costs RM634 million and is 70% funded by Prasarana, 15% by Sunway Bhd and the rest by Unit Kerjasama Awam Swasta, a facilitation fund. The system uses eco-friendly electric bus services on elevated tracks and connects major areas within the areas such as hospital, commercial areas, the system is expected to provide services for 500,000 residents. The Federal Territories in Malaysia comprise three territories, Kuala Lumpur and Labuan, governed directly by the federal government of Malaysia. Kuala Lumpur is the capital of Malaysia, Putrajaya is the administrative capital. Kuala Lumpur and Putrajaya are enclaves in the state of Selangor, the territories fall under the jurisdiction of the Ministry for the Federal Territories, which was formed under Prime Minister Abdullah Ahmad Badawis administration on 27 March 2006. The first Minister for the Federal Territories was Mohd, Tengku Adnan Tengku Mansor has been the minister since May 2013. The federal territories were part of two states - Selangor and Sabah. Both Kuala Lumpur and Putrajaya were part of Selangor, while Labuan was part of Sabah, Kuala Lumpur, the state capital of Selangor, became the national capital of the Federation of Malaya in 1948. Since independence in 1957, the federal as well as the Selangor state ruling party had been the Alliance, however, in the 1969 elections the Alliance, while retaining control of the federal government, lost its majority in Selangor to the opposition. The same election resulted in a race riot in Kuala Lumpur. 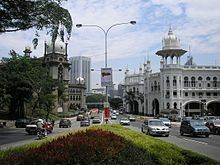 It was realised that if Kuala Lumpur remained part of Selangor, the solution was to separate Kuala Lumpur from the state and place it under direct federal rule. On 1 February 1974, Kuala Lumpur became the first federal territory of Malaysia, the Sultan of Selangor, Sultan Salahuddin cried after signing the cession agreement as he was very fond and proud of the city. The cession of Kuala Lumpur had the effect of securing the Selangor state government for the Barisan Nasional until the 2008 general election. The separation of Kuala Lumpur meant that Kuala Lumpur voters lost representation in the Selangor State Legislative Assembly, Labuan, an island off coast of mainland Sabah, was chosen by the federal government for development into an offshore financial centre. Labuan became the federal territory in 1984. Putrajaya is a city, designed to replace Kuala Lumpur as the seat of the federal government. Sultan Salahuddin, who was serving as the Yang di-Pertuan Agong at that time, was asked again to land to the federal government. The Petronas Towers from their bases. Today a "Green Dragon" covers Petaling Street. Replica of the King's Tengkolok Diraja (Royal Headress), a part of the Regalia of Malaysia. It is a songket made of black fabric embroidered in gold threads, wrapped in the Dendam Tak Sudah style originating from Negeri Sembilan. Letter of Appointment of His Majesty, the XIII Yang di-Pertuan Agong. Courtesy of the office of the Keeper of the Rulers' Seal, Conference of the Rulers of Malaysia. Oath of Office of His Majesty, the XIII Yang di-Pertuan Agong. Courtesy of the office of the Keeper of the Rulers' Seal, Conference of the Rulers of Malaysia. 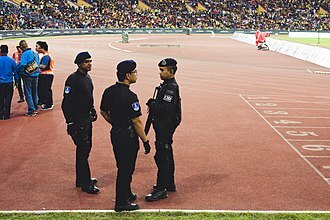 Officers of the Royal Malaysia Police on duty at the men's football final. Parade of Nations at the Opening Ceremony of the 29th Southeast Asian Games. The cauldron of the 2017 Southeast Asian Games inside the stadium. A standard Peninsular Malaysian number plate, registered in Penang and affixed on a dealership plate frame. A Kuala Lumpur-registered "HW" taxi number plate. The Minardi PS02 displays KL flag which driven by Mark Webber.